Right now large parts of the world are probably oblivious to the fact that the vast majority of the remaining 166 prisoners at Guantánamo Bay have been on hunger strike since early February. Triggered by claims of worsening treatment by prison guards and desecration of the Koran, coupled with increasing despair that after over eleven years of detention the fate of Adnan Latif may be the easiest way out of Guantánamo, the official response has been denial. Nonetheless, since initial admissions earlier this month that 6 prisoners are on hunger strike, that number has now risen to over 28. Lawyers for the prisoners put that number as being closer to 130. Rather than address the legitimate concerns raised by the prisoners and their lawyers, the US military has put the protest down to “frustration” and is instead seeking almost 200 million dollars for renovations, “repairs and upgrades” to the prison. The US military and administration are not alone in misreporting, if reporting at all, events at Guantánamo Bay. Interest in the plight of the prisoners – held almost wholly without charge or trial – has waned over the past few years, particularly since Barack Obama’s long-broken promise to close the prison. In spite of remaining one of the most potent contemporary symbols of injustice, the anniversary of the prison camp receives almost no media coverage. Hunger strikes and the recent admission that rubber bullets were fired at prisoners in January stir minimal response. Even during the US presidential campaign, the death of Adnan Latif and a serious blow to the credibility of the military commission regime by the US Federal courts received scant coverage. Arbitrary detention at Guantánamo and the injustice associated with it have long become non-issues. The media, which should be a tool to hold government to account, has instead bought into the official “bad men” narrative. In Britain, incidents at Guantánamo Bay are rarely reported in spite of the continued detention of British resident Shaker Aamer. Silence on the matter maintains public ignorance and legitimises the extralegal system that operates there (coupled with prisoner abuse and injustice). This latest hunger strike is entering its fiftieth day tomorrow, a stage at which such action becomes life-threatening and can cause permanent organ damage. Yet it has only now started to attract the attention of the mainstream media in the US and Britain, mainly parroting the official response and playing down the seriousness of this protest. By ignoring the plight of these prisoners the states these men are from have also abdicated their responsibility. Of the remaining 166 prisoners, more than half are cleared for release but have nowhere to go. States like Britain should use the opportunity presented by this situation to demand the release of the innocent men; for the British government, this is an ideal opportunity to prove its commitment, beyond words, to reuniting Shaker Aamer with his family. Writing here on the tenth anniversary of Guantánamo, I stated that the failure of politicians meant that it is now down to “ordinary people” to take action. The work done by grassroots organisations and independent journalists is testimony of that. Solidarity actions have already been held in the US and the UK. As this hunger strike enters a potentially fatal stage, people around the world with an understanding of justice must do whatever they can to resist the official narrative of silence and denial, and ensure that Adnan Latif’s death is an exception and not a trend. Aisha Maniar is a human rights activist who works with the London Guantánamo Campaign. 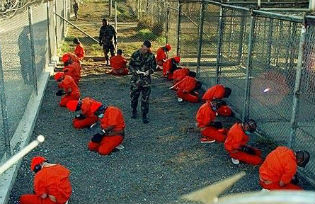 The London Guantánamo Campaign has been campaigning since 2006 for the release of all prisoners held at Guantánamo Bay, the closure of Guantánamo and other similar prisons and an end to the practice of extraordinary rendition.